The Ukrainian president exposed his preference for Clinton during the US presidential campaign, explains Daniel McAdams, executive director at Ron Paul Institute, adding that it could have resulted in a change of tone in the US after Trump’s win. US President Donald Trump met Ukrainian opposition leader Yulia Timoshenko last week. According to Timoshenko, Trump reassured her that the US wouldn't remove sanctions on Russia until there’s peace in East Ukraine. The former Ukrainian prime minister reportedly had a brief informal meeting with Trump last Thursday, before he spoke to the National Prayer Breakfast at the Washington Hilton. — RT (@RT_com) 6 февраля 2017 г.
RT: Was this meeting between Trump and Timoshenko significant in your opinion? Daniel McAdams: I think it is very interesting for a number of reasons. First of all, it is very significant that President Trump spoke with Yulia Timoshenko before he spoke with Petro Poroshenko. I am certain that move was heard very loudly in Kiev. We don’t know what they talked about, but I think it’s very significant. I also think the White House’s readout of Trump’s discussion with Poroshenko was pretty anodyne, without detail: they had a nice talk; they discussed the dispute between Russia and Ukraine – whatever that means; and they pledged that the US would work together with Russia and Ukraine to solve the problem. There was no finger pointing; there were no attacks; there were no discussions of the Minsk accords. Unless it was just a very short synopsis of what happened, I think there has been a change in tone. I think if we contrast it between the White House’s readout of the discussion between then-Vice President [Joe] Biden and President Poroshenko just a couple of months ago and even after, it was after the election in the US, there was talk about the need to implement the Minsk agreements; there was talk about hopefully the EU-Ukraine Minsk agreements; there was talk about hopefully the EU-Ukraine summit would result in more assistance for the Ukrainian people; more support that Ukraine needs to get its IMF funding. This was all completely absent in the readout of the discussion between President Trump and President Poroshenko. It leads one to believe they didn’t talk about these specifics, and that President Poroshenko may be walking away with less than he was hoping. But let’s not forget, Poroshenko jumped into the fray during the presidential campaign. He was caught doing some things to try to help Hillary [Clinton] get elected. Not very much reported in the US media. But it certainly is a fact that he was involved. So he exposed himself; he exposed his preference for Hillary Clinton to win the Presidency. So when Trump won, he put himself in a pretty bad position. Maybe that is why Trump wanted to talk to Timoshenko. Maybe he has other ideas for who should lead Ukraine. RT: Before Trump was elected, Ukraine's top officials used derogatory words to describe him on social media. The Minister of Internal Affairs called Trump “a dangerous outcast.” Ukraine's permanent representative to the UN called the future president “a clown that has gone off the rails” and that he posed “a greater danger than terrorism.” All the negative posts were later deleted. 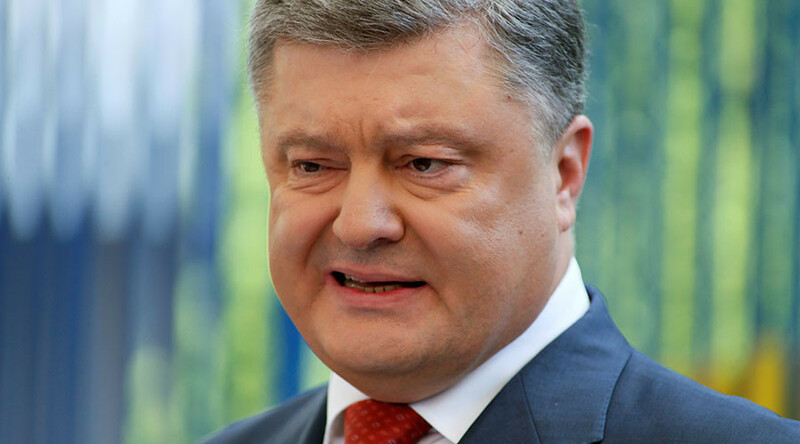 Do you think Poroshenko is in hot water at the moment? DM: I don’t know that he is in hot water, but he is also, don’t forget, getting mixed signals from the US. There was this extraordinary trip that Senators John McCain and Lindsey Graham took to the front lines in Ukraine on January 2, where Senator Graham on videotape telling the Ukrainian troops: “You need to go on the offensive in 2017.” He also said: “When we get home we’re going to make sure that we punish Russia.” What kind of a signal does this send to the Ukrainians when they urge to go on the offensive? By the way very shortly after they told them that, they did start a new offensive. There is a real crisis in Washington. And this is the President’s own party. The President, according to our Constitution, has a broad leeway in making foreign policy. Certainly, Congress, the Senate, and the House have an important oversight role. But from this tape that we saw the Senators in Ukraine - they are clearly making US policy in a way to undermine the policy of their own President. I just can’t see President Trump not doing something to put a stop to this.